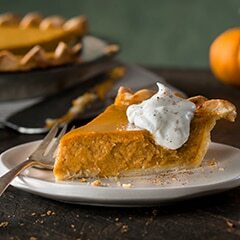 Bake Country Crock's Pumpkin Pie recipe when you want to impress! Serve it up as a Thanksgiving dessert or enjoy it any time of year. Combine sugar, salt and spices in small bowl; set aside. Beat eggs with pumpkin with electric mixer, then beat in sugar mixture. Slowly add milk. Pour into Flaky Pie Crust. Cool on wire rack 2 hours. Chill, if desired. * For Flaky Pie Crust, combine 1 cup all-purpose flour, 1-1/2 tsp. sugar and 1/4 tsp. salt in medium bowl. Blend in 6 Tbsp. Country Crock® Baking Sticks with pastry blender or two knives to form coarse crumbs. Add 2 to 3 Tbsp. ice water, 1 Tbsp. at a time, and mix with fork until dough forms. Knead dough with lightly floured hands until mixture forms a ball. Roll out dough on lightly floured surface from center to edges, forming a 12-inch circle. Press into 9-inch pie plate. Fill.